Thoughts are sometimes generated out of random conjunctions in time between otherwise unrelated events. 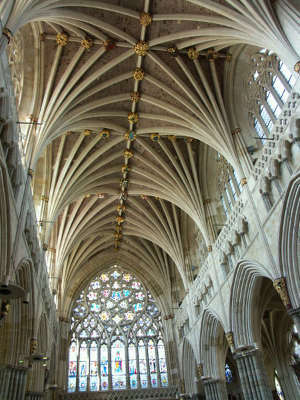 Last week we were on holiday in Dorset, and depressing weather for the first couple of days drove us into the nearest city – Exeter, where we visited the cathedral. I had never seen it before and was more struck than I had expected to be. Stone and wood carvings created over the past 600 years decorate thrones, choir stalls and tombs, the latter bearing epitaphs ranging in tone from the stern to the whimsical. All this lies beneath the marvellous fifteeenth century vaulted roof – the most extensive known of the period, I learnt. 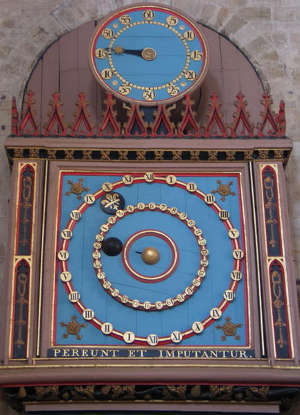 Looking at this, and the cathedral’s astronomical clock dating from the same century, I imagined myself seeing them as a contemporary member of the congregation would have, and tried to share the medieval conception of the universe above that roof, reflected in the dial of the clock. The other source of these thoughts was the book I happened to have finished that day: Max Tegmark’s Our Mathematical Universe*. He’s an MIT physics professor who puts forward the view (previously also hinted at in this blog) that reality is at bottom simply a mathematical object. He admits that it’s a minority view, scoffed at by many of his colleagues – but I have long felt a strong affinity for the idea. I have reservations about some aspects of the Tegmark view of reality, but not one of its central planks – the belief that we live in one universe among a host of others. Probably to most people the thought is just a piece of science fiction fantasy – and has certainly been exploited for all it’s worth by fiction authors in recent years. But in fact it is steadily gaining traction among professional scientists and philosophers as a true description of the universe – or rather multiverse, as it’s usually called in this context. Nowadays there is a whole raft of differing notions of a multiverse, each deriving from separate theoretical considerations. Tegmark combines four different ones in the synthesis he presents in the book. But I think I am right in saying that the first time such an idea appeared in anything like a mainstream scientific context was the PhD thesis of a 1950s student at Princeton in the USA – Hugh Everett. The thesis appeared in 1957; its purpose was to present an alternative treatment of the quantum phenomenon known as the collapse of the wave function. A combination of theoretical and experimental results had come together to suggest that subatomic particles (or waves – the duality was a central idea here) existed as a cloud of possibilities, until interacted with, or observed. The position of an electron, for example could be defined with a mathematical function – the wave function of Schrodinger – which assigned only a probability to each putative location. If, however, we were to put this to the test – to measure its location in practice, we would have to do this by means of some interaction, and the answer that would come back would be one specific position among the cloud of possibilities. But by carrying out such procedures repeatedly, it was shown that the probability of any specific result was given by the wave function. The approach to these results which became most widely accepted was the so-called ‘Copenhagen interpreatation’ of Bohr and others, which held that all the possible locations co-existed in ‘superposition’ until the measurement was made and the wave function ‘collapsed’. Hence some of the more famous statements about the quantum world: Einstein’s dissatisfaction with the idea that ‘God plays dice’; and Schrodinger’s well-known thought experiment aimed to test the Copenhagen interpretation to destruction – the cat which is presumed to be simultaneously dead and alive until its containing box is opened and the result determined. Everett proposed that there was no such thing as the collapse of the wave function. Rather, each of the possible outcomes was represented in one real universe; it was as if the universe ‘branched’ into a number of equally real versions, and you, the observer, found yourself in just one of them. Of course, it followed that many copies of you each found themselves in slightly different circumstances, unlike the unfortunate cat which presumably only experienced those universes in which it lived. Needless to say, although Everett’s ideas were encouraged at the time by a handful of colleagues (Bryce DeWitt, John Wheeler) they were regarded for many years as a scientific curiosity and not taken further. Everett himself moved away from theoretical physics, and involved himself in practical technology, later developing an enjoyment of programming. He smoked and drank heavily and became obese, dying at the age of 51. Tegmark implies that this was at least partly a result of his neglect by the theoretical physics community – but there’s also evidence that his choices of career path and lifestyle derived from his natural inclinations. During the last two decades of the 20th century, however, the multiverse idea began to be taken more seriously, and had some enthusiastic proponents such as the British theorist David Deutsch and indeed Tegmark himself. In his book, Tegmark cites a couple of straw polls he took among theoretical physicists attending talks he gave, in 1997 and again in 2010. In the first case, out of a response of 48, 13 endorse the Copenhagen interpretation, and 8 the multiverse idea. (The remainder are mostly undecided, with a few endorsing alternative approaches). In 2010 there are 35 respondents, of whom none at all go for Copenhagen, and 16 for the multiverse. (Undecideds remain about the same – to 16 from 18). This seems to show a decisive rise in support for multiple universes; although I do wonder whether it also reflects which physicists who were prepared to attend Tegmark’s talks, his views having become more well known by 2010. It so happens that the drop in the respondent numbers – 13 – is the same as the disappearing support for the Copenhagen interpreation. Nevertheless, it’s fair to say that the notion of a multiple universe as a reality has now entered the mainstream of theoretical science in a way that it had not done half a century ago. There’s an argument, I thought as I looked at that cathedral roof, that cosmology has been transformed even more radically in my lifetime than it had been in the preceding 500 years. The skill of the medieval stonemasons as they constructed the multiple rib vaults, and the wonder of the medieval congregation as they marvelled at the completed roof, were consciously directed to the higher vault of heaven that overarched the world of their time. Today those repeated radiating patterns might be seen as a metaphor for the multiple worlds that we are, perhaps, beginning dimly to discern.